Oligosaccharides [Greek oligo = few; sacchar = sugar] are carbohydrates composed of 3 to 9 monosaccharides. Oligosaccharides are often added to commercial foods as sweeteners or fiber. Oligosaccharides, except maltotriose, are indigestible, which means humans lack enzymes to break them down in the small intestine, so they reach the large intestine, where beneficial colonic bacteria break them down (ferment) to absorbable nutrients, which provide some energy–about 2 Calories (kilocalories) per gram in average . Certain breakdown products of oligosaccharides–namely short-chain fatty acids (SCFAs)–may have beneficial effect on large intestinal lining. Most oligosaccharides act as a soluble fiber, which may help prevent constipation. Ingestion of large amount of oligosaccharides can result in abdominal bloating and excessive gas (flatulence). Prebiotics are non-digestible nutrients that selectively promote the growth of normal intestinal bacteria that may have beneficial effects on the large intestinal lining. Oligosaccharides currently considered as prebiotics include fructooligosaccharides (FOS) or oligofructose and trans-galactooligosaccharides (TOS) . I really do not understand what the difference is between Saccharomyces and that with MOS. Elaine, MOS refers to mannan-oligosaccharides, which are a type of oligosaccharides. Saccharomyces is a type of yeasts often found in probiotic supplements. The statement “…short chain fatty acids may have beneficial effect on large intestinal lining” needs to be seriously modified. The qualifier “may” is not only very misleading but incorrect. SCFAs are incredibly important for the function of the bowel as well as other parts of our body. There is INSUFFICIENT EVIDENCE about the effectiveness of short-chain fatty acids (SCFA) in the prevention or treatment of colorectal cancer [2,8,9], ischemic stroke, treating obesity, high blood cholesterol, diabetes type 2, sickle cell disease, Crohn’s disease and ulcerative colitis [10,11,12,13], post-infectious irritable bowel syndrome (IBS) , increasing calorie delivery in cystic fibrosis , prevention ammonia or toxins absorption from the intestine, constipation, antibiotic-associated diarrhea. The role of SCFA produced by the intestinal bacteria in immunity is not clear yet: they may either promote or inhibit inflammation in the body [17,18,19]. The numbers in brackets are references from that article. In summary, the authors of the studies agree that SCFAs nourish the beneficial intestinal bacteria and the intestinal lining, but it has not yet been clearly established if they can actively treat or prevent intestinal or immune disorders. Thank you for continuing to use consistent reference points for your statements. Your sources are as complete as what there are. If there are data to the contrary or are more diverse, they just have not yet been published in your sources. Such data may exist, but you are being faithful to information within the boundaries of your principles and sources. Much appreciated. Hm, I mentioned in the article that short-chain fatty acids (including butyric acid), as a breakdown products of oligosaccharides, may be beneficial for intestinal health. You can also read here: http://www.nutrientsreview.com/lipids/short-chain-fatty-acids-scfa.html . Is saccharomyces found in probiotics? Saccharomyces is found in some, but not all, probiotic products – you can usually read this on the product label. Is there a problem if you have had an autoimmune disease, if it is included in a Prebiotic product, as in Prebiothrive? “It might” – it’s probably a theoretical warning, not something proven by studies. FINALLY, someone understands ‘may’ vs. ‘might’! You are ‘one in a million’, and I suspect that you already knew that! ‘May’ = permission, e.g., May I use your pen? ‘Might’ = probability, e.g., It might snow tonight. If I avoid foods with oligosaccharides because of adverse gastrointestinal reactions will I be compromised in other ways? Oligosaccharides are not essential nutrients, so avoiding them should not be harmful. I guess you probably mean oligosaccharides as food additives. It’s hard to avoid all oligosaccharides as naturally found nutrients in the foods, though. Can you help out with the Oligosaccharides concentrations of feedstuffs like palm kernel cake, wheat offal, brewers’ dried grain that are often used in monogastric animals nutrition in the humid tropical countries like Nigeria? Can these feedstuffs be used as prebiotics in the diets of these animals? The producers should know this. Don’t humans have alpha galactosidase which can digest complex oligosaccharides? Alpha-galactosidase is in the normal intestinal bacteria (in the colon) and can break down oligosaccharides, but it is not in the intestinal mucosa. 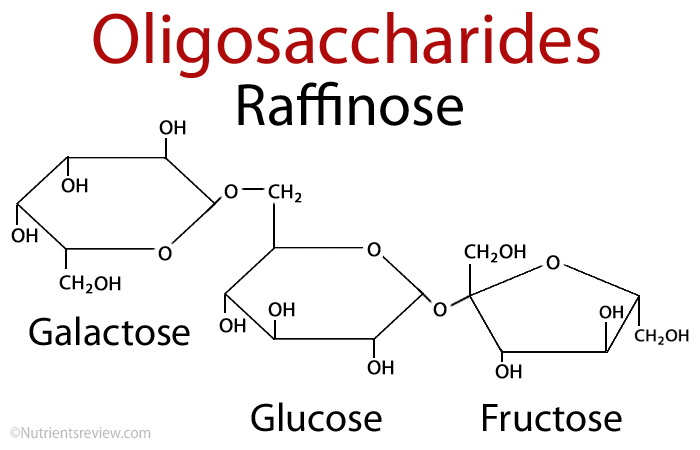 The raffinose family of oligosaccharides–including stachyose and verbascose–occurs in seeds of food legumes at levels that cause flatulence in man and animals. These carbohydrates escape digestion because there is no α-galactosidase activity in mammalian intestinal mucosa and because they are not absorbed into the blood. Consequently, bacteria in the lower intestinal tract metabolize them to form large amounts of carbon dioxide and hydrogen and to lower the pH. The amount and pattern of expelled gases reflect differences in type, location, and abundance of intestinal microorganisms possessing α-galactosidase activity in a favorable nutrient environment.